Mr. Stevens (a must follow on Twitter if you’re the tweeting type) was referring Cincinnati and their trip to Toledo for a taste of MACtion. And just like those other BCS conference teams, the Bearcats left with a loss. Perhaps a lucrative new TV deal can help keep the conference’s top teams from heading to MAC schools for mid-season match-ups. So a little shine is off the Louisville-Cincinnati match-up this weekend, but the conference is performing better than any preseason prognostications imagined. The top 5 teams are a combined 30-4. Rutgers and Louisville are 15th and 16th in the latest BCS standings, while Boise has moved up to 21st. The computers really like Rutgers (average of 10th), but Boise’s hill to climb (currently 20th in computers) got harder this weekend with Nevada’s loss. Say hello to your new leader in the New Big East. OK, so Temple was up 10-0 at the half, but it was all Rutgers after that point. Scarlet Knights QB Gary Nova threw 4 TDs in the 2nd half and RB Jawan Jamison had 19 rushes for 114 yards to go with 5 catches for 81 yards and a TD (putting him 10 yards shy of 1,000 all purpose yards on the season). The Rutgers defense also dominated the 2nd half, allowing Temple just 5 plays in Rutgers territory, scoring a TD on a fumble recovery, and yielding just 39 yards of offense. Rutgers’ defense ranks #3 in rushing defense, scoring defense, and turnover margin and is #14 in total defense. With the shaky performances Louisville has had recently, I couldn’t deny Rutgers and that defense anymore. They host Kent State Saturday afternoon (ESPN3, 3:30pm). This was the kind of game where you wonder if the young Cardinals players had maybe read a few too many press clippings or looked a little too far ahead past the Bulls. But after BJ Daniels put the Bulls ahead with 3:26 to go in the game, sophomore Teddy Bridgewater led an 8-play, 75-yard drive that took just 1:34 off the clock. That was just the icing on the cake that was Bridgewater’s afternoon where he went 21-25 for 256 yards and 2 TDs and carried another 10 times for 74 yards (that’s 330 of 384 total yards). Louisville hosts Cincinnati this Friday night (ESPN2, 8pm). Speaking of dominant defenses, Boise State’s was clearly too much for the MWC’s worst offense to handle. Yielding just 210 yards of offense, Boise forced 3 turnovers (2 of which turned into TDs) and gave up no offensive points (UNLV scored on a fumble in the 4th quarter). They did all of that without DL Demarcus Lawrence, the team’s sack leader who was suspended for the game for a violation of team rules. The Broncos are 8th in pass defense, 20th in total defense, 6th in scoring defense, and 9th in turnover margin. Boise travels to Wyoming this weekend (CBSSN, 3:30pm). Those of you who have kept up with the power rankings know that the Bearcats haven’t exactly been jumping out of the blocks the last few weeks. They got away with it against Miami (OH) and Fordham, but spotting Toledo 13 points, including a Jermaine Robinson interception of Munchie Legaux that was returned 75 yards for a TD, was a mountain that turned out too great to overcome. Cincinnati actually took the lead in the 3rd quarter, but Toledo answered, returning the ensuing kickoff 91 yards for a TD to give them the lead for good. Toledo is no slouch of a team – they’re 7-1 with the only loss coming in overtime in their season opener at Arizona. But just as Boise learned, voters are always looking for a way to drop non-traditional teams so they can keep ranking teams like West Virginia after consecutive blowouts. The Bearcats travel to Louisville for the Friday night showdown (ESPN2, 8pm). UCF is clearly the cream of the crop in the East Division of C-USA having already beaten ECU, but they were a little sluggish against Memphis this week. What was just a 4-point UCF lead at the half could just as easily been a 3-point deficit had TE Alan Cross not fumbled the ball on 2nd and goal from the UCF 1 yard line in the first quarter. The Knights got their house in order for the 2nd half and extended their lead to 35-10 before Memphis scored a touchdown in garbage time. Given the sorry state of C-USA this year, a Nov 17th matchup at Tulsa appears to be the only challenging game left on the schedule. Marshall, who is 2-1 in conference, hosts the Kinghts this weekend (CBSSN, 8pm). This was a huge win for the Aztecs, who now control their own destiny in in the MWC. Nevada came into this game with a lot of talk (including from me) about how the MWC was going to come down to their game against Boise at the end of the season. But SDSU, led by sophomore backup quarterback Adam Dingwell (starter Ryan Katz injured his ankle in the first quarter), ruined those aspirations. Nevada held the edge in virtually every statistical category, but gave up 10 points in the final 3:34. SDSU went 2nd in OT and got the win by converting a 2-point try after scoring on a 21-yard TD pass. The Aztecs host UNLV this Saturday night (Time Warner Sportsnet, 8pm). What a way to get above .500 and the first win versus a Big Ten team since 1979. Navy rallied from 9 down in the 4th quarter to get the victory. The defense we had grown to love over the last month showed up huge in the 4th after a lackluster game, forcing a punt after closing it to 6 with under 6 minutes to go, then intercepting Hoosier QB Cameron Coffman to seal the win. 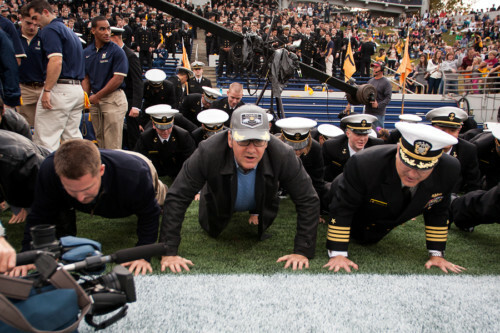 Oh, and Navy had Kevin Spacey doing push-ups on the sidelines. Navy travels to ECU this weekend (FCS, 3:30pm). Temple played a hell of a first half against Rutgers and looked like they were on their way to a 3rd consecutive Big East conference win. But there’s clearly a talent gap after their years in the MAC, and Rutgers was able to expose it on both sides of the ball in the 2nd half. Temple only has 11 games on the schedule this year, so they’re going to need 3 wins in the final 5 games if they want to get bowl eligible. Given that Cincinnati and Louisville are still to come, this weekend’s game against Pitt is a must win (Big East Network, Noon). I’m not even going to try to figure this one out. A week after losing to Tulane, SMU not only beat Houston, they beat them by 30 points on only 384 yards of offense. You can get that score-to-yardage ratio when you turn the other team over NINE times. And of those nine turnovers, three were interceptions returned for touchdowns and a fourth was a fumble returned for a touchdown. The Mustangs host Memphis on Saturday (Time Warner Texas, 3pm). There was a lot of good to take away from playing one of the best teams in the New Big East close on the road. Bulls running back Lindsey Lamar rushed for 110 yards on Louisville’s top-30 rush defense. BJ Daniels threw for three touchdowns before finally having an interception on the last play of the game. But USF’s defense just couldn’t stop Teddy Bridgewater in the closing moments after taking a 25-21 lead. USF can only afford one more loss, making this weekend’s game against Syracuse critical to postseason hopes (ESPN3, 7pm). Like I said – NINE turnovers. When they weren’t turning the ball over, Houston was moving the ball at will and scoring points. They only punted twice on 15 drives. The problem is 15 possessions minus 9 interceptions minus 2 punts equals not enough touchdowns to win. The Cougars have to just put this game behind them, look at the tape to see why there were so many turnovers, and concentrate on this week’s matchup versus UTEP (CSS, 4:30pm). Anyone who watched this game on Friday night was witness to a pretty miserable performance by the Huskies in Paul Pasqualoni’s return to Syracuse. UConn finished the night with negative six yards rushing while yielding 251 yards on the ground to Suracuse – nearly double the Orange’s average. While being shut out in the 2nd half, UConn managed just 56 yards of offense before their final drive – a 60-yard march that ended with an interception. A bye awaits this week before a November-3rd match versus USF that will probably end the bowl hopes of one of the teams involved. Like I said in the UCF summary, Memphis played a decent first half. But a decent half isn’t going to get the Tigers out of the NBE cellar. Memphis has been outscored 225-127 this year, is 116th out of 120 in passing, 114th in scoring, and 95th in scoring defense. And they host an SMU team that scored 72 last week – yikes (Time Warner Texas, 3pm). Are you arguing that Temple is less talented now than they were in their first Big East stint? good point. no, just in reference to the timeframe in which the school decided to start taking football seriously and how that stacks up against places like louisville and rutgers. I would expect the talent level at temple will improve with the move back to the NBE and the increased commitment to the program. oopsies – it’s funny, when I proof, I don’ read the scores because I have spent the time aggregating the results and have seen them multiple times. guess no more skipping that line in the future!